The comment illustrates Wilberforce’s innate optimism, but the “we” also reveals something. Though he was probably the greatest social reformer of the 1800s, he never worked alone. When he was converted to evangelical faith in 1785, Wilberforce soon found himself at the center of a group of well-connected and well-heeled individuals. This group, called the Clapham Sect, combined their considerable talents, religious zeal, and optimism in a concerted campaign of national reform. And in large measure, they succeeded. Here are some of the leading members and what they accomplished as individuals and as a group. Whenever a new cause was championed by the Clapham friends, and a society organized to carry it out, Henry Thornton was the one who gave practical business advice and financial support. He was almost sure to be asked to be the treasurer. After his conversion, Wilberforce had retreated to the mansion of Henry’s father, John Thornton, who lived in Clapham. Wilberforce soon became fast friends with Henry. Henry purchased his own house at Clapham in 1792, and he and Wilberforce lived there together as bachelors for five years. Later, when each had married and established his own family, they lived as neighbors on the same estate. It was around Wilberforce and Thornton that the “sect” gradually formed. Henry, like his father, was a highly successful merchant banker. He had a superb mind for abstract economics, and his business savvy was matched by a liberal generosity. He gave away six-sevenths of his income before he was married and more than a third of it afterward. Probably his greatest personal efforts were expended in directing the affairs of the Sierra Leone Company, a Clapham—inspired enterprise to establish a colony of freed slaves in West Africa. Thornton was a Member of Parliament for many years, but he never neglected his domestic duties. He conducted regular family worship, and a volume of his family prayers was published after his death. Unlike most of his younger friends at Clapham, Granville Sharp had no inherited wealth and had to work to support himself. But work seemed to come easy to Sharp. While working away at law, he taught himself Hebrew so he could defend Christianity to a Jew, and then Greek, to oppose an infidel skeptic. Sharp was older than most of the other associates of Wilberforce and more loosely associated with Clapham. But he had pioneered in the early efforts against slavery and helped recruit Wilberforce to the cause. 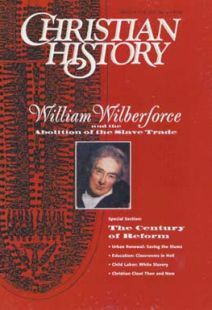 When Wilberforce was still a child, without any legal training, Sharp had single-handedly overturned the legal opinion of the majority of the most eminent judges in England. Sharp happened upon a slave in London who had been cruelly beaten and abandoned by his West Indian master. Sharp took up the slave’s case and achieved, in this case and others, many legal precedents, including the famous 1772 ruling which essentially declared that any slave who set foot in English territory had become free. Sharp had his share of eccentricities. He rose at dawn to sing Psalms in Hebrew to the accompaniment of his harp. He was also keenly interested in the prophetic parts of Scripture. He once gained an audience with the prominent statesman Charles Fox and proceeded to explain to him why Napoleon should be identified with the “little horn” in Daniel 7. His political views were more radical than those of most Claphamites, but with them he ardently supported many religious and philanthropic causes. The Sierra Leone experiment was begun at his initiative. He was also one of the founders of the Sunday School Society, the Bible Society, and the Society for Promoting the Conversion of Jews. In 1792, through the patronage of John Thornton, Venn became rector of the parish church in Clapham. He quickly became a spiritual guide to the group, joined in their deliberations, and even led several causes. Venn set up one of the first organized systems of parish visitation, conducted confirmation classes, and formed the Society for Bettering the Conditions of the Poor. With friends he financially supported six local schools and took pride that every child in Clapham could receive a free education—an unusual achievement in that day. He saw to it that the parish was vaccinated against smallpox, having his own family vaccinated first as an example. On the national scene, Venn was the prime mover behind the Church Missionary Society. As founding chairman in 1799, he set it on its influential course as a thoroughly Anglican and evangelical enterprise in foreign missions. Although she lived far from Clapham, in Somerset, More had the closest of links with Wilberforce, Thornton, and their friends. As a young woman, More moved in some of the most fashionable intellectual circles in London, and included the actor David Garrick and Samuel Johnson among her friends. She soon earned a reputation as a successful poet and playwright. After becoming a “serious” Christian in the 1780s, she sought to win her high society friends to her views. She took pen in hand, and her Thoughts on the Manners of the Great (1788) became a best seller. Yet More’s most significant work was as an educator and writer on behalf of the lower classes. Prompted by Wilberforce, she and her sister began to work among the poor in the Mendip Hills, south of Bristol. With financial help from Thornton, she soon had over 500 children organized in schools across an area of some 75 square miles. This became the most well-known venture in religious and popular education supported by the Clapham Sect. More believed the laboring classes needed inexpensive and edifying material to read (among other reasons, so they would not become engrossed in irreligious and politically inflammatory tracts). So she wrote a series of Cheap Repository Tracts, which sold at a penny or half-penny a piece and were subsidized by Thornton. Within a year, over two million had been sold. If any of the Clapham Sect were in doubt about a fact or figure, they used to say, “Look it up in Macaulay.” Such was Zacharay Macaulay’s reputation for doing research. Macaulay, as an estate manager in the West Indies, quickly became disgusted with Jamaican slavery. He returned to England in 1792— only to be selected as the Clapham choice to turn around the fortunes of Sierra Leone. For six years as governor, his administration was plagued by threats of insurrection, harassment by slave-trading interests, and marauding French squadrons before he could bring some order and prosperity to the colony. He did not seek the most comfortable means to return to England. He somehow talked his way onto a slave ship—to collect eyewitness evidence of the horrific conditions of the Middle Passage from Africa to the West Indies. In England Macaulay became a one-man research department for all Clapham causes, and especially for the cause of abolition. With an almost photographic memory, he tirelessly gathered facts, sifted evidence, digested parliamentary papers, and submitted all to powerful analysis. It became a dictum that Macaulay could be quoted verbatim on the floor of the House of Commons without fear of contradiction. His energies were not exhausted by the antislavery cause. He was the first major editor of the influential Christian Observer, which began in 1802 and quickly became the chief organ of Anglican evangelical piety. He was a member of 23 philanthropic and religious societies and on the governing committee of nine. The list of influential Claphamites could easily be expanded to include James Stephen, Charles Grant, and John Shore. There was also the indefatigable Thomas Clarkson, one of the key, if forgotten, British abolitionists. He once searched systematically through every ship in England, port after port, in order to find a sailor whom he thought could provide evidence against slavery. (Clarkson found him in the 57th ship.) At Cambridge there was the knot of students and clergy who surrounded the famous preacher Charles Simeon. They embodied the Clapham Sect’s attempt to “evangelicalize” the Church of England from within. Aghast at the irreligion and violence of the French Revolution, the well-to-do at Clapham abhorred many democratic reforms. They supported several repressive measures designed to stave off revolution by keeping political agitators in check—including the Peterloo Massacre in 1819, a violent breakup of a mass meeting about parliamentary reform in which 11 people died. Yet the views of the Clapham Sect were more liberal than was typical for people of their station. Wilberforce often rebuked the sins of the rich and powerful. His friendship with William Pitt, the prime minister, was strained by Wilberforce’s public denunciation of dueling (a “sin” of the aristocratic class) in the wake of Pitt’s well-known duel with a political enemy. Moreover their religious and humanitarian ideals helped bring about a more egalitarian society. The message of salvation for all, the rhetoric of antislavery, and the call for individual responsibility helped move England toward democratic reforms. The Clapham Sect pioneered techniques of mobilizing public opinion that have become commonplace in democracies. They exploited the media outlets of the day: lectures, billboards, newspapers, and pamphlets. They made effective use of voluntary societies and unprecedented use of petitions to exert public pressure on Parliament. Bruce Hindmarsh is a visiting research fellow at Oxford University and author of John Newton and the English Evangelical Tradition (Oxford University Press, 1996).